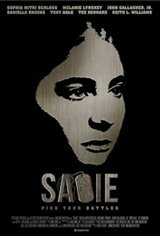 Sadie is the powerful, unsettling and darkly funny story of a young girl who will stop at nothing to preserve her father's place on the home front. Sadie is the daughter of a soldier and she models herself after his military example. When her mom, Rae, begins dating a new man, Cyrus, Sadie vows to come between them, whatever it takes. Cyrus becomes the enemy, and if she's learned anything from the world she inhabits, it's that the enemy deserves no mercy.